By William Knox, this was Abraham Lincoln's favorite poem. It is also next up on my "to-memorize" list. Read more about Oh, why should the spirit of mortal be proud? Okay, I'm really not sure what took me so long to read this book. 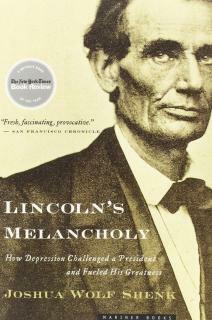 The subtitle of this book is How Depression Challenged a President and Fueled His Greatness, so it's basically about Lincoln and how he lived with depression. I really like this book. I really like this book a lot. I highly recommend this book for anyone who has had a depressive episode, had or has clinical depression, or had or has chronic depression. The book describes how depression, also known as the manly "melancholy" of yesteryear (yester-century? ), was viewed in the 1800s (much, much differently than it is these days); how friends and family rallied around a melancholic person to help; how being sad wasn't considered a failing, it was considered different. Talk about a different viewpoint than these days, where if you're not happy, there must be something wrong with you. I liked the one point in the book where the theory that happy people are actually the unbalanced ones: they have an over-inflated sense of self and their skill-sets, versus depressed people who have a more grounded realistic view of reality. About half way through the book, I liked it enough to buy a hard copy of the book. It helps that I'm a fan of Lincoln, I suspect. But really, there are enough good quotes in the book that I wish I had it right now to copy them all down right here. On my way back to the hotel, Jessica texted me that she was in a meeting, to take my time, so I decided to walk along the Great Mall. I wanted to see the Lincoln Memorial, more so than any other monument or statue in the area. Since there wasn't any reason not to go, I went. I was quite entertained at the pickup game of ultimate happening on the Mall. I ended up setting a couple games, one was a lunchtimate game, of crappy quality and not enough people. The other was a high level game with subs, enough for another game, if they wanted to start another game. As much as I wanted to join in the fun, I was there to walk the Mall, so I kept walking. The sun cooperated with me with the Washington Monument. I felt the irony was lost on the Dubnium-sounds-like-a-dumb-president, who authorized the World War II monument. Yes, I was really there. Eventually I made it to the Lincoln Memorial. Although there were "Quiet please, be respectful" signs up all over the place, the place was loud. I went up the stairs, dodging small children and school aged kids as they darted in front of me playing on the stair, and walked into the Memorial. I had hoped it would be quiet. It wasn't. Didn't stop me from crying though. I was overwhelmed with emotion, and unable to do much more than step behind a column and wait until the moment passed. It did. I had a big red nose, and tears in my eyes. I guess that's the point of these Memorials, to help us remember those who are dedicated in these buildings, remember their actions, their work, their successes.